Today the GOLD PRICE rose $4.20 to $1,107.70 while SILVER lost 13.3 cents to $14.36. 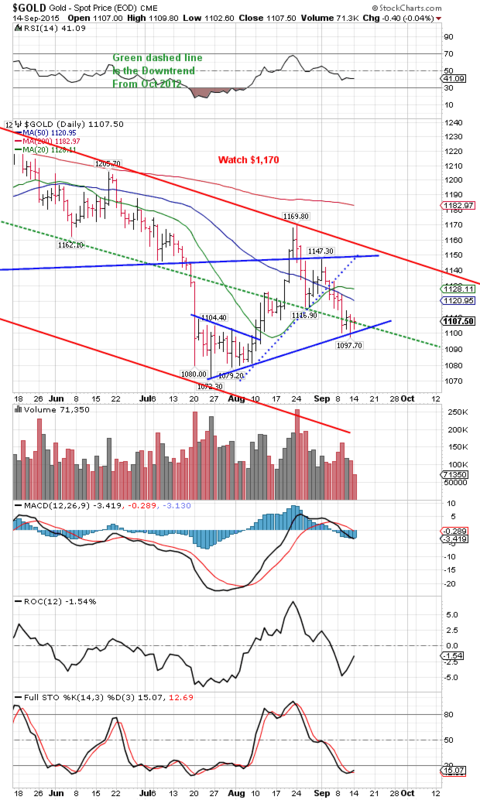 Last week the GOLD PRICE fell until it hit the uptrend line from its July low. If I’m looking at it right, that completed the correction that began with the August high at $1,169.80. Therefore any price around here is a low risk buy. In my nat’ral born durn Tennessee fool opinion, the Fed’s announcement, raise rates or not, will help silver and gold prices because it will remove that uncertainty and show the Fed for the ancient, toothless hamster it really is. Gold price chart on the right. SILVER PRICE last week and today twice tested support about $14.33 and passed the test. Today’s low hit $14.31. Considering all the bombs that have been dropped on silver’s head in the last six months, it ought to be washed out, that is, it has fallen as low as it will go. Do not foolishly discount silver’s ability to snap back. That huge shortage in the physical market and deliveries delayed out six to twelve weeks point to huge buying. Today the premium on US 90% silver coin on the wholesale sell side rose to $4.95/ounce. We can get SOME live silver rounds and 100 ounce bars, but they aren’t cheap. Want the least expensive privately minted silver rounds? You’ll wait 6 – 12 weeks. We have some silver Brittanias as well as silver Kangaroos (shipping next week) and plenty of US 90% silver coin, but all at higher prices. My vacation was very restful. We went to one of the sea islands off South Carolina. I went out the first day and got my sunburn, so I got that done early in the week and got to spend the rest of the time with my family, doing nothing much, and visiting with an old friend. Last week while I was vacationing, silver and gold prices dipped steadily lower. Stocks teased, rose, then lost their gains. US dollar index lost ground, platinum took a beating, and palladium held firm. Looks like the Fed’s chickens are coming home to roost, and somebody might wind up covered in chicken manure. After teasing markets for more than a year, now looms the fabled September FOMC meeting when the Fed might/maybe/perhaps raise interest rates. If they raise rates, stocks crater. If they don’t raise rates, the dollar craters, taking the bond market with it, a bond market that dwarfs the stock market. What’s Mother Yellen, who has never yet successfully run a hot dog stand, to do? Probably raise rates a tiny quarter percent. No, it is not possible to pity the Fed in the least. Frankly, I’m having trouble fighting off a severe attach of Schadenfreude. Meanwhile, markets are frozen, waiting for the FOMC. Silver and gold prices eroded last week, but maybe the interest rate news will be good news for metals, since the thing oppressing them has probably been the threat of a rate rise and hence a higher dollar. Remember the pattern lately has been “stocks sink, dollar sinks with them.” Thus the magnetism of stocks might take the dollar down with them. But this week makes little difference in the long term, since the cake is already baked. Stocks will suffer a bloody wound this month, the peak has passed, and the next five years or so will. shave ten thousand points off the Dow. This will happen whether the Fed raises interest rates 0.25%, 2.5%, or 25%. And silver and gold will benefit from the financial fear. Dow has painted out a flag or pennant which promises to fall to 14,000. Nothing changed last week. Neither the Dow nor the S&P500 could even climb over the 20 DMA. Today the Dow slipped 62.13 to 16,370.96, down 0.38%. S&P500 lost 8.02 (0.41%) to 1,953.03. Weakness in metals raised the Dow in Gold and Dow in Silver last week, but it was a “tale told by an idiot, full of sound and fury, signifying nothing.” Nothing changed. 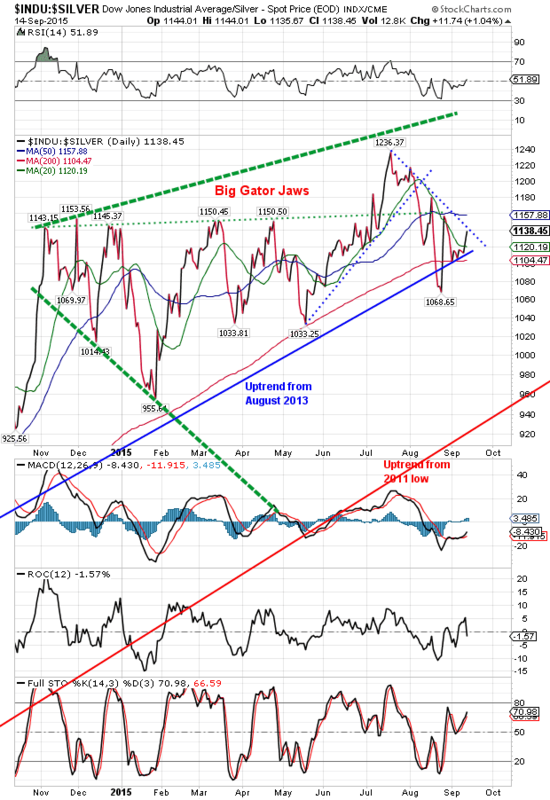 Both indicators peaked in July, both markets have broken down, both will fall much lower. Dow in gold on the right, Dow in silver on the left. 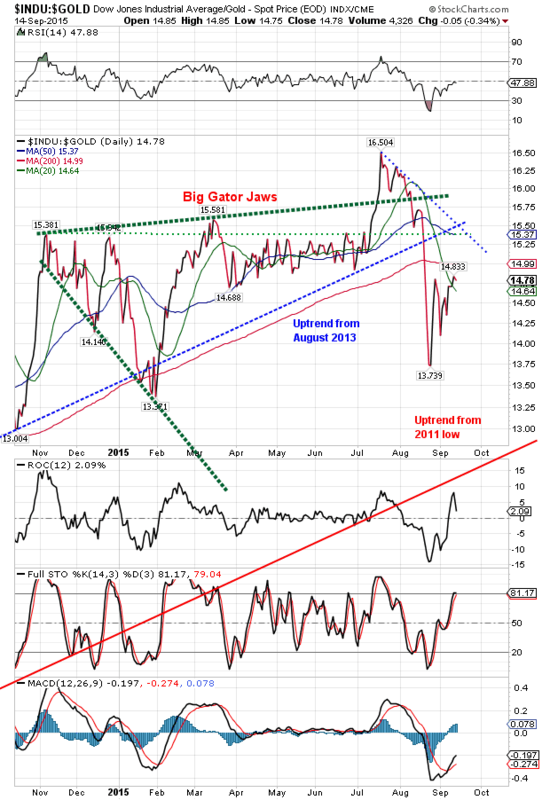 US dollar index last week looked like a Poland China hog trying to play piano. Spent most of the week moving lower, and ended wedged between its 200 DMA (95.18) and 20 DMA (95.18). Dollar’s intention will not be plain until it sinks below 93 or rises above 96.6. Today the dollar index rose 20 basis points to 95.39. The euro lost 0.1% to $1.1318. Interesting to watch the European Elite trying to commit suicide-by-immigration for the whole continent. Europe has so succumbed to its self-hatred that it’s like a man who can’t even close the door in his own house and tell the guests it’s time to go home. All was a sentimental gush until suddenly yesterday the Germans slammed shut their borders. Somebody must have figured out what it was going to cost to house/educate/give welfare to all those immigrants, and suffered a moment of sanity. And for folks who think the Hungarians are mean-spirited for not letting 800,000 immigrants park there, I remind you that number would amount to about 9% of Hungary’s total population. Meanwhile the Japanese yen rose 0.35% to 83.22.